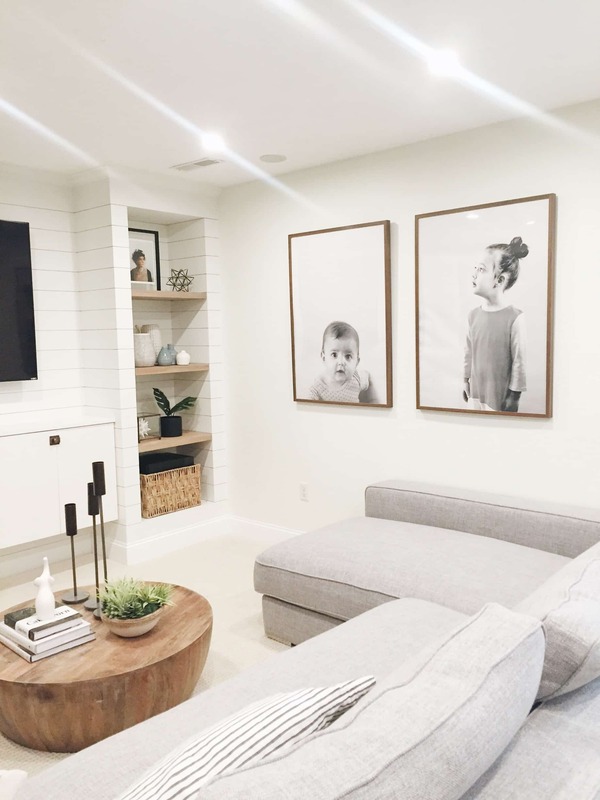 This basement living room mood board has affordable and functional ideas for a casual play room. 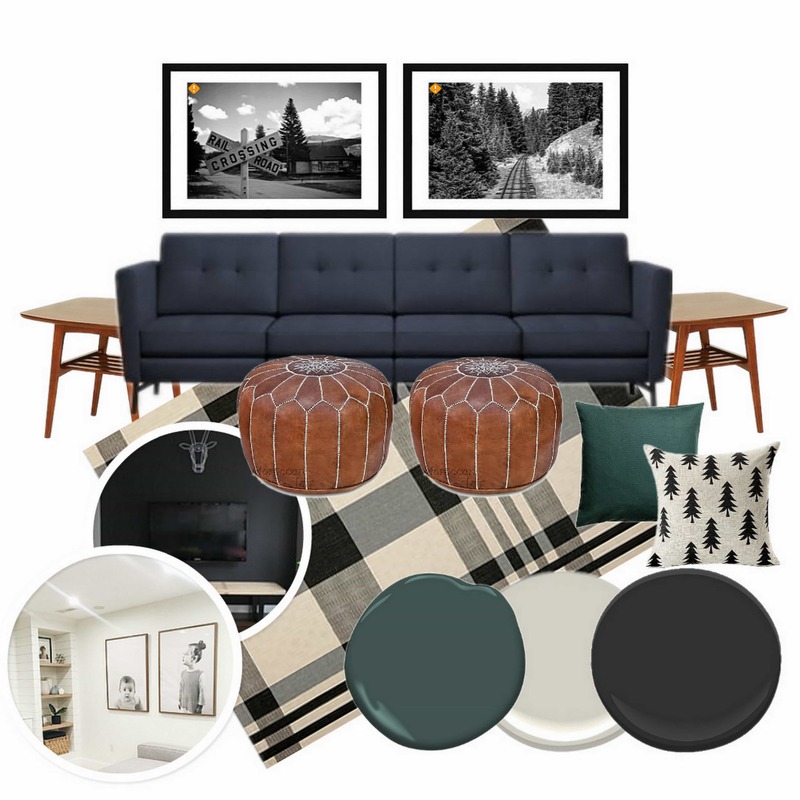 **Contains Affiliate Links** Safavieh Buffalo Check Rug, Engineer Prints, Black TV on Black Wall, Side Table, Pine Tree Pillow, Green Pillow, Moroccan Pouf, Burrow Sofa Paint Colors (All Benjamin Moore): Hidden Falls, Edgecomb Grey, Midnight Oil. Since moving into this house almost two years ago, I’ve redone JUST about every space in this house. 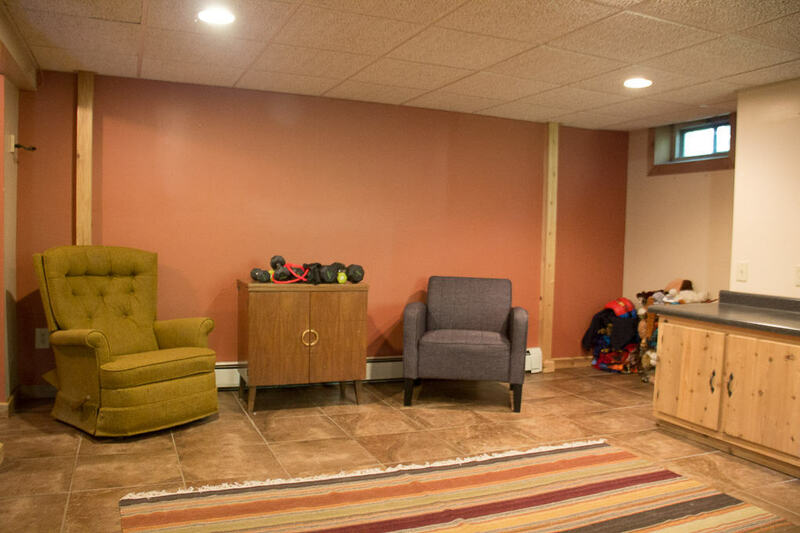 The one VERY neglected space is the basement! The room has very peachy tile, orange walls, and I’ve only made it worse by adding an orange rug and peach couch! 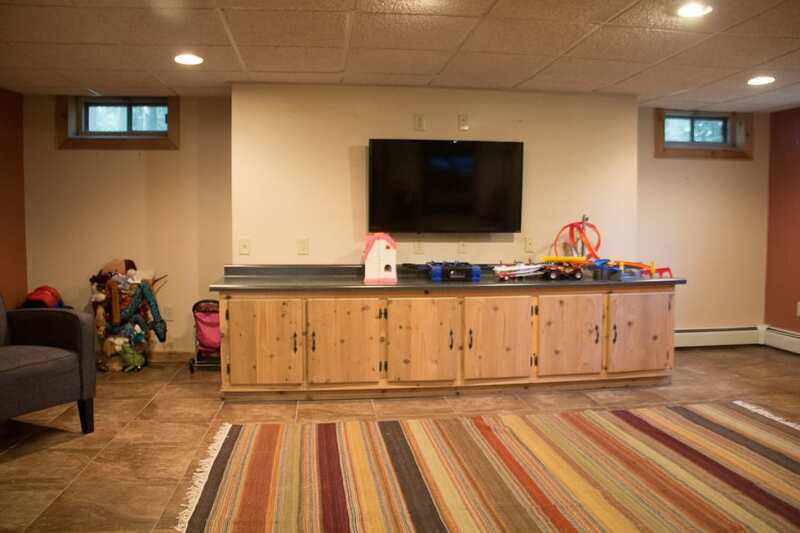 This is the room where we store all the kids toys, and it needs to be a room that designed for the kids. This means NOTHING fragile, durable furniture, and open spaces to play. I’m hoping to use mostly furniture pieces that we already own, and decorate the rest of the room affordably. I’m planning on using the two cutout nooks for creating desks for the boys. I love this tutorial from Chris Loves Julia on creating oversized engineer prints. I think these would look great on the one big empty wall. The hard part is going to be choosing which pictures of the kids to use! 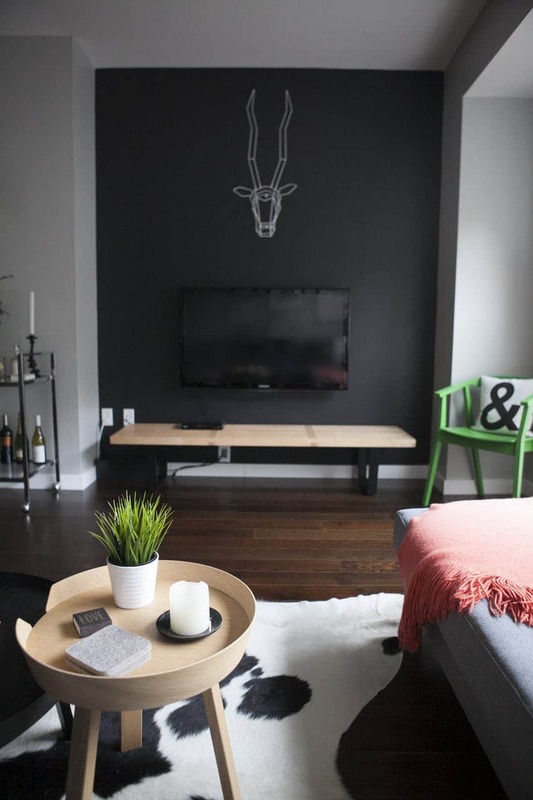 I also love the idea of painting the TV wall black like this, so that the tv camouflages into the wall. I’ve actually already began painting, added a few items to my Amazon cart today! I’m hoping that I can get this room put together and usable for the kids before it starts to get too cold outside! Come our LONG winter it will be nice to have a cozy spot for them to play! **10/17/17** Update! 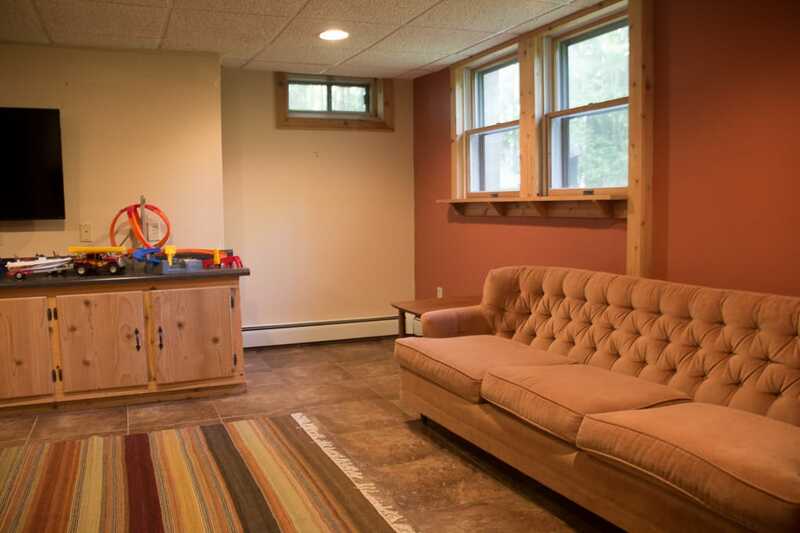 We finished the playroom! Here’s the post, with all the details, and one little spoiler shot too! Ooh! I love it. I’m excited to see it come together. Great plan. Love the black TV wall idea, so genius! Can’t wait to see the results! Thanks! I just finished photographing it and I’m going to try to share it tomorrow!